OMEGA’s Limited Series launch of the Speedmaster Professional 50th Anniversary is sure to create a stir among Moonwatch purists. To celebrate the 50th anniversary of the Speedmaster – the first and still the only watch to have been worn on the Moon – a Limited Series of 5,957 stainless steel pieces with a special commemorative design of a golden seahorse on the dial will give collectors a rare opportunity to own a piece of space history. The physiognomy of the 42 mm Professional Chronograph Moonwatch with its black dial, chronograph counters and tachymeter scale bears the DNA of the original hand-winding 1957 Speedmaster and its heart is powered by the famous Calibre 1861 that accompanied the watch into zero gravity. Launched in 1957 and designed to measure speed with chronograph and tachymeter functions, the Speedmaster has proved time and time again an invaluable and life saving partner to pilots, astronauts and explorers as they defy boundaries and push to ever-higher limits in the exploration of the universe. With an impressive track record of 11 NASA tests and 6 Moon landings, the Speedmaster has been on every US manned space flight and is currently on board Russia’s ISS International Space Station making this manual-winding timepiece a cornerstone of horological and space history. 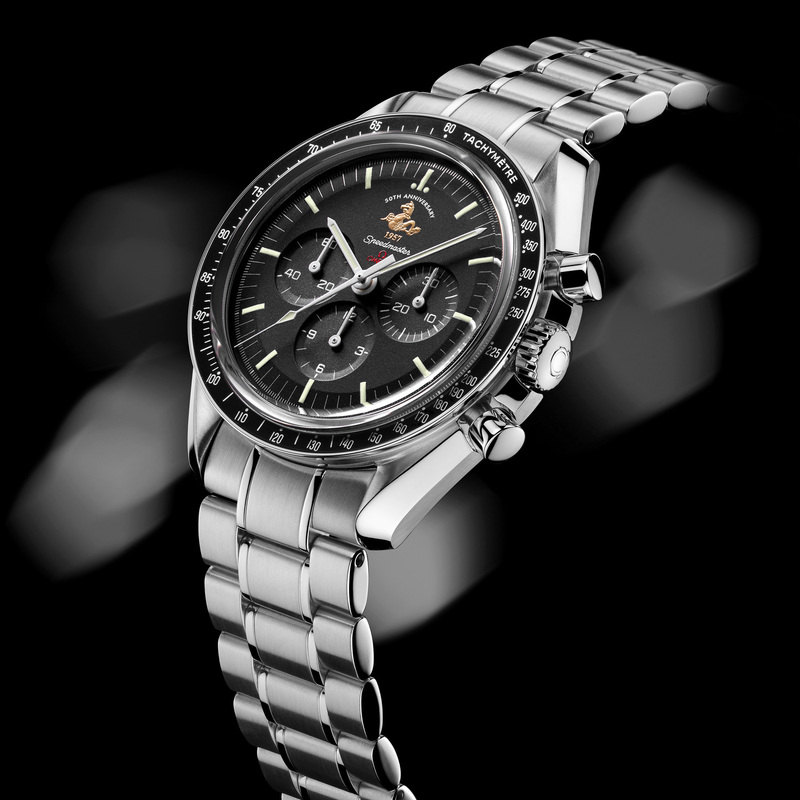 OMEGA’s Speedmaster Chronograph was officially “flight-qualified by NASA for all manned space missions” in 1965 although the Speedmaster had already been to space on the wrist of astronaut Walter Schirra on board the Sigma 7 in 1962. Able to withstand extreme temperature changes and zero gravity, the Speedmaster touched down on the moon with Apollo 11 astronauts in July 1969 and subsequently became known as the Moonwatch. During the troubled and dramatic Apollo 13 “Houston, we’ve had a problem here” mission of 1970, the Speedmaster saved the day. An explosion of a reserve oxygen tank compromised all the time keeping mechanisms on board: except one. Commander James Lovell relied on his Speedmaster Chronograph to time, within a fraction of a second, the extremely critical firing of the re-entry rockets allowing for the safe return of his crew to planet Earth. 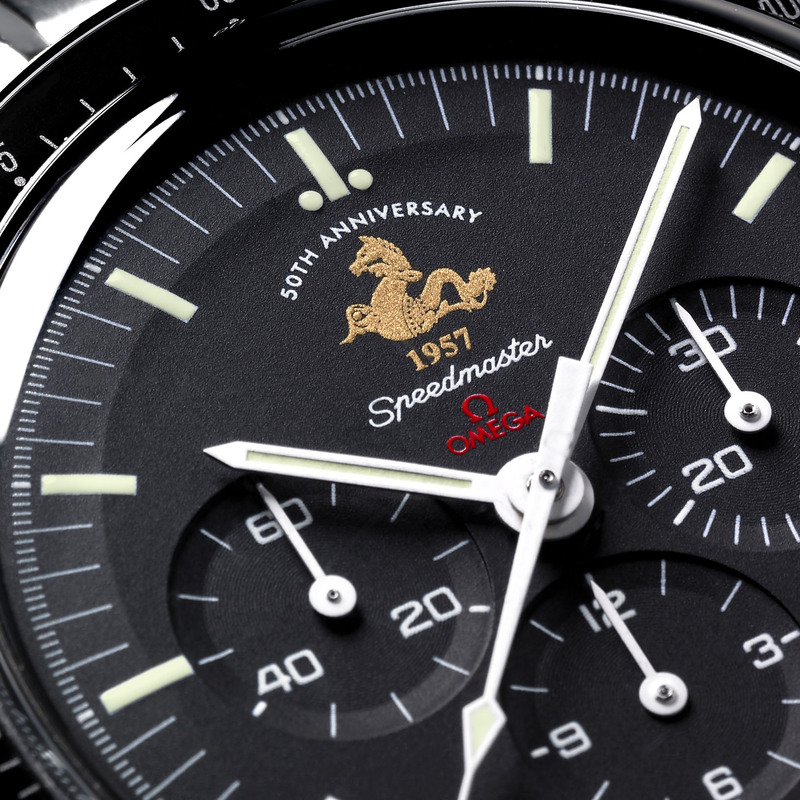 In recognition of the crucial role that its Speedmaster chronograph played on the Apollo 13 mission, OMEGA received the “Snoopy” Award in October 1970 – the highest honour awarded by NASA astronauts. The Speedmaster was present for yet another decisive moment in space history during the 1975 joint USSR-USA Apollo-Soyuz docking. The symbolic handshake in space at the height of the Cold War revealed that both crews were wearing the Speedmaster Chronograph. To celebrate its half-century of life, the words ‘50th Anniversary’ crown the golden seahorse featured at 12 o’clock on the dial. The hour and minutes hands, the central chronograph seconds hand and baton indexes have been highlighted with Super-LumiNova for maximum legibility in any conditions -on earth or in space. Although the original 1957 Speedmaster featured the iconic “Broad Arrow” hands, these were replaced in 1963 with “Dauphine” hands. Being slimmer, they create more space on the dial for a clearer view of the three counters with 12 hour, 30 minute and 60 second totalisers that proved vital on the Apollo 13 mission. As a tribute to its space legacy, the hands on this watch are white, just like those on the Apollo 11 mission to the Moon. The Arabic numerals on the counters and on the characteristic black aluminium tachymeter scale on the bezel have been designed with maximum clarity and legibility in mind. A scratch-resistant sapphire crystal with anti-reflective treatment protects the dial of this Limited Series Moonwatch. Purists will appreciate the respect shown for the original Speedmaster in the manual-winding movement. In fact, the Limited Series Moonwatch is powered by OMEGA Calibre 1861, the famous movement that accompanied man on the moon and a tribute to its resilience. The 42 mm stainless steel case of the Limited Series Moonwatch has inherited dominant Speedmaster family traits with its iconic curved and facetted horns and its large push buttons to activate the chronograph. A seahorse medallion has been embossed on the stainless-steel case back as well as the number of the Limited Series 0000/5957 and the words: “FLIGHT-QUALIFIED BY NASA FOR ALL MANNED SPACE MISSIONS. THE FIRST AND ONLY WATCH WORN ON THE MOON”. Space enthusiasts will remember the original ‘Velcro’ strap designed to fasten the Speedmaster to the exterior of the astronauts’ spacesuits during their missions. Inspired by the first solid link bracelet of the 1960’s, this Limited Series Moonwatch is fitted with a stainless steel bracelet that straps to the wrist with a foldover clasp. With a 45-hour power reserve and water-resistant to 50 metres/167 feet, the Speedmaster Professional Moonwatch has proved it can withstand extreme atmospheric conditions on Earth and in space and, with this limited Series release, is destined to become a coveted collector’s item. This entry was posted in Press Release, Speedmaster Professional and tagged 311.30.42.30.01.001, 50th Anniversary, Limited Edition on April 19, 2007 by Dale Vito.